Now that the weather is becoming cooler, you'd think I'd be looking forward to lots of hearty soups and stews, but frankly, I'm just not quite ready to let go of summer just yet. So, I decided to do a pot of steamers. It was JUST the thing for a sunny breezy Sunday afternoon. It's ready in a snap, it's super easy, and OMG it's SO delicious! Be sure to serve it with some nice warm crusty bread for sopping up the rich flavorful broth. It's heaven in a bowl! And your friends will think you went to a LOT of trouble when they taste this one. So, give it a try, and have a taste of summer no matter how cold it is outside! Melt butter in a medium pot over medium-low heat. Add shallots and garlic and cook for 2-3 minutes until shallots are soft and garlic is fragrant but not burned. Add wine and increase heat to medium-high until wine is brought to a simmering boil. Add clams and cook covered for 5-7 minutes, stirring occasionally, until clams have opened. Discard any clams that are still closed. Add parsley and pepper flakes (if using) and give the pot a quick stir. 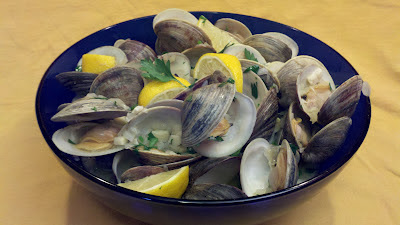 Transfer clams and broth to a large serving bowl, serving with lemon wedges on the side. -Before you start, make sure you really clean the clams. Since the shells will be cooking right in the broth, you really need to scrub each one on all sides with a scrub brush under cold running water. Yes, I know it's a little tedious, but it's SO worth it! And seriously, it's better than having sand in your bowl. Also, if any of the clams are open, give them a little tap with your finger. If they don't close right up, that means game over and you need to discard them. -Btw, the ingredient amounts are just guidelines. If you like more butter, go for it. If you like tons of garlic, have at it. If you'd like a little less onion, no worries. It's whatever you like! -And remember to always use a wine that you would drink, and never ever use anything labeled "cooking wine". It's basically laden with sodium and food coloring and is not very good, especially in a dish where wine is one of the main components of the recipe.